HVAC stands for Heating, Ventilation, and Air Conditioning. HVAC systems are meant to give you control over your home’s heating and cooling temperatures. Most people refer to HVAC systems by their more common names such as central air conditioners, ductless AC units, furnaces, heat pumps, or boilers. 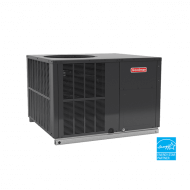 They sometimes come in combined packages that offer heating and cooling in one unit or in areas with more predictable climates you may only need one or the other. An HVAC system can be any combination of a heater unit & cooling unit, all of which are discussed below. 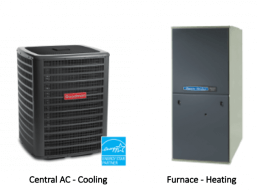 Purchasing a new HVAC “Heating Ventilation and Air Conditioning” system is an important investment for your home that takes research and general knowledge to get the best prices & system. This HVAC buying guide will help you feel more comfortable going into an HVAC installation project by giving you common technical terms and meanings associated with each system, average costs, and which unit is best for your home. The list below represents the most popular types of HVAC systems and how they are most commonly combined to heat and cool the air in your home. 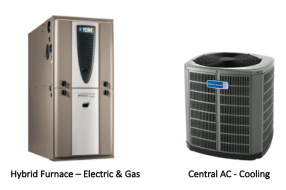 Depending on if you need a new HVAC system installation or simply a replacement of either unit for heating or cooling, you will need to know the basics components that can make up an HVAC unit. Compare local heating and cooling contractors with our HVAC Contractors Near Me page to compare quotes from reliable HVAC contractors in your area who can help you make the best choice for your home’s cooling needs. The most common type of HVAC system is the heating & cooling split system. Split HVAC units have two main systems one dedicated to cooling your home and one dedicated to heating your home. They usually contain one indoor unit such as a furnace (found in a garage, utility closet, crawl space, garage, attic, or basement) and one outdoor unit such as a central air conditioner often located outside on a flat cement foundation called an AC pad. The central air unit uses refrigerant, compressors and coils to cool air, and a fan to blow out your home’s hot air. These systems are often managed by a centrally located thermostat within the home that pushes air throughout vents and ducts in your home. A hybrid split system is a similar option to the split HVAC system mentioned above and are very energy efficient in comparison due to the fact that they have an electric hybrid heater system. This gives the homeowner the ability to choose between gas power or electric power to heat a home. These split hybrid heating and cooling systems are great for climates where you need to be able to choose your home’s temperature due to changing climate in your area during colder months. This HVAC system is also controlled by a thermostat located within the home and forces air through your home’s ductwork. This type of system can save you money long term by decreasing high energy bill costs. A ductless HVAC system, or mini split unit is beneficial for some homes based on certain needs for your household. A ductless system has multiple inside units located in each room that you would like to have controlled heating and cooling. The mini split units are mounted on your home’s walls and connect to a compressor located outside of the home. Mini split units are easier to install than a central AC system but usually cost more upfront. You want to cool or heat only one particular room, such as a garage or a new room that was added to the house. You do not use all of the rooms in your home and you would like to be energy efficient with your air conditioning use for only rooms you utilize. You prefer independent control of room temperature across multiple areas of your home. Packaged heating and cooling systems are a combination unit that contains both the heating & air unit all in one. This HVAC type is usually installed in the attic or in a multi-story home’s top floor in a storage space. It is able to cool and heat a home with one unit and is incredibly energy efficient. It’s often used in areas where warmer climates are common. The heat is electrically generated and can fall short in comparison to more powerful heating options. However, there are advanced combo units that utilize both gas and electric heat output in order to be powerful and energy efficient when needed. 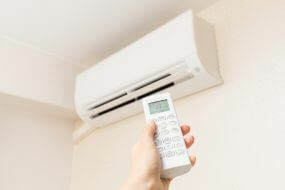 Central air conditioning systems distribute cool air throughout your home using a circuit or series of connected ducts. Split systems — both an inside and outside component — are the most common types. Refrigerant circulates between the condensing and evaporator coils and the air is cooled as it passes through the evaporator coil. A blower assembly — fan and motor — provides the necessary circulation to distribute the conditioned air. A heat pump is a variation of a central air conditioner. Heat pumps are capable of delivering both heated and cool air. They work by transferring the inside heat to the outside during the summer months to cool the home, and extracting heat from the outside air or ground to the inside during the winter months to warm it. Heat pump systems are one of the most energy efficient systems available today. Although a heat pump will cost you more up front, the energy savings realized over the first few years of its operation usually pay for the additional costs. A furnace is part of the forced air family as well. There are various types of furnaces with the most common using gas combustion or electric resistance heat strips to produce the necessary heat. Most are equipped with a blower assembly to distribute the heated air throughout the home. Since a furnace is only capable of producing heat it is sometimes retrofitted with a central air conditioner to provide cool air during the summer months. Quite possibly the most important part of your HVAC installation process will be hiring an HVAC contractor. When dealing with such a big investment, it is important to compare quotes, talk to 3 or 4 reputable local contractors, and feel comfortable with your decision. Familiarize yourself with the basic principles of HVAC, the basic terminology of the main components and how they work together to maintain your comfort levels. This will allow you to communicate with your contractor easier during the course of the job. Use Modernize as a reference for finding reliable contractors. We only work with reliable HVAC contractors who are known for their quality of work and extensive knowledge in the field to help you make the best decision for your HVAC replacement. It also does not hurt to ask around and get referrals from friends or neighbors who have had a new system installed or an old HVAC unit replaced recently. The average homeowner who uses Modernize saves money on their HVAC installation project. Our knowledgeable & trusted contractors can help you make your decision. Our contractors are here to help and happy to answer any questions you have throughout the process. Whether you hire a qualified contractor within the Modernize network or go with an outside source, there are a few things to be sure and always ask about your project. A good contractor will always be able to prove that they are knowledgeable, qualified, and trustworthy. You should always ask your contractor for a list of the necessary building permits for your particular project. Though you can obtain this yourself, quality contractors should be willing to do this for you. Having the HVAC contractor request this document adds another layer of protection and trust for you. In doing so, they will have to produce a valid contractor’s license with applicable insurance to obtain it. During the bidding process, contractors should calculate the required cooling and heating capacity of your home using a recognized method such as the ACCA’s residential load calculation Manual J, and Manual D for ductwork. This allows them to assess the necessary cooling and heating requirements on a room-by-room basis. If they fail to do this or simply try to sell you the same sized system be very wary. Many variables can affect an HVAC system’s performance besides room size including your home’s window and door quality, type of construction and the degree it is insulated. Your contractor should inspect and consider all of these areas when sizing the new unit as well as give you a print out of calculations, assumptions and ductwork design when applicable which you can use in price negotiations with other contractors. The contractor should verify if your home’s existing ductwork is adequate for the new HVAC system installation. If he/she finds that it falls below industry standards or is incorrect, they should point out the problem and discuss avenues to correct it. This will increase the cost of the total installation and should be included in the final estimate. Do not sign any contracts until you have interviewed at least three contractors and received written estimates from all of them. If they throw “this deal is good for today only” at you, consider that another red flag and move on to a contractor that doesn’t force a sell. After receiving the HVAC installation estimates, go over each one with a magnifying glass. Take into consideration the contractor’s level of experience and knowledge he/she conveys during the interview process as well as reviews and rating they may have built up for their business. After you complete your HVAC installation, it is in your best interest to protect your investment by scheduling annual maintenance with the HVAC contractor you chose. Some HVAC companies even offer discounted labor rates for customers who sign up with their yearly maintenance programs. Periodic maintenance keeps your unit running at peak efficiency and prevents unexpected breakdowns that can lead to costly repairs. Although most maintenance procedures require a trained technician, you can do your part by cleaning or replacing the filter as needed.